What does yoga have to do with recovery? Quite a lot, according to Google. Search “yoga for addiction,” and you will find countless articles from professional sources about the benefits of yoga in recovery. Yoga is not just for women, hippies, or the extremely flexible. It has been found to effectively regulate stress hormones that, when imbalanced, contribute to anxiety, depression, PTSD, and substance abuse. St. Joseph Institute alumni know that a yoga practice is part of our schedule. Several mornings each week, our residents are led in a series of yoga poses. In addition to easing the symptoms of detox, yoga helps our residents surrender the desire to control their circumstances. It helps them connect to their body and their breath to reach a state of inner calm. According to Jennifer Dewey, fitness manager at Betty Ford, “Addiction takes a person out of their body and prevents them from connecting to who they are physically and feeling what their body is telling them. Yoga is a great way to slowly reintroduce someone to physical sensation. It’s also very relaxing, so in terms of the anxiety, stress, and depression that arise from detox, it’s invaluable in helping people stay calm and grounded” (Yoga for Addiction Recovery). The word ‘yoga’ comes from Sanskrit and is commonly interpreted today as ‘union.’ Fundamentally, yoga’s purpose is to unify body, mind, and spirit—and to unite all three with God. For this reason, meditation is the goal of an authentic yoga practice, and different types of yoga use different routines and poses (asanas) to develop strength and flexibility and to prepare the body for meditation. Since many of us find it difficult to sit still to meditate, moving through a series of yoga poses can more easily bring us to a meditative state. At St. Joseph’s, we find that combining morning yoga with prayer and meditation helps residents connect with God and prepares their bodies, minds, and spirits for the day’s work. Of course, it’s easy to get out of a yoga routine once rehab ends, so we encourage our alumni to continue making yoga part of their recovery. Yoga Journal offers a series of simple poses and affirmations designed particularly for those in recovery. 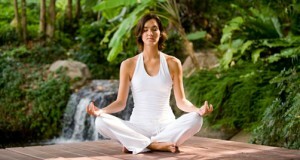 • A yoga class should make you feel safe and comfortable. If you feel like you don’t fit in, don’t force yourself to stay. Keep trying different classes until you find one that makes you feel good. • A yoga class should push you to move beyond your physical limitations, but very gently. If you feel pressured to complete a pose or routine that is too difficult for you, find another class. • A yoga class that incorporates meditation and holistic health will probably be more helpful for you in the long run than one that focuses mainly on yoga as exercise. • Even if you are physically fit, sign up for a beginner’s class. Yoga is different than running, biking, or weight-lifting. Allow your body to adjust to its demands slowly and comfortably. • Think of yoga as your own practice; call it “my yoga practice” to remind yourself that your progress is your own and that you don’t have to compete with anyone else. • Be honest with your yoga instructor about any physical limitations or other concerns you might have. • When possible, choose a yoga class that is conveniently located and not too expensive. It’s hard enough to get ourselves out of the house, so limit possible excuses to skip class. As you continue to practice your recovery, consider yoga as a way to nurture your body and spirit and to help mitigate the anxiety, stress, and physical pain that can lead to relapse.